F SPORT 2, NAVIGATION, RIOJA RED INT., LOW KMS! Sporty, luxurious, and economical. 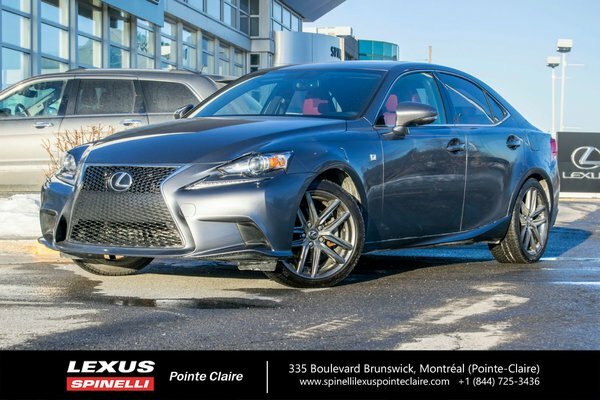 This 2015 LEXUS IS 250 AWD with the F SPORT 2 package is great on so many levels. Low kilometers. Only 34 134 kms! Only one owner. Never accidented. CARFAX vehicle history report available and without incident. Leased new and well maintained at Spinelli Lexus Pointe-Claire. CERTIFIED SPINELLI! Remainder of Lexus warranty until May 22, 2021 or 110 000 kms. 3 Spoke F Sport steering wheel. Engine : V6 Cylinder Engine 2.5L - V6 cyl.